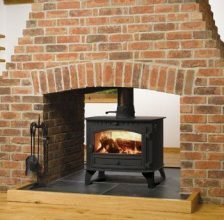 Leeds Stove Centre has an extensive range of Double Sided Stoves available to order online for home delivery. Our range of double sided stoves are ideal for fitting, or a dividing wall between two rooms. Our choice of stoves come in a variety of styles to suit modern homes or more traditional styled homes. Double sided stoves are perfect for large open-plant living rooms or can add the wow factor to commercial properties. For example, in the middle of a restaurant, pubs or hotel lobbies. 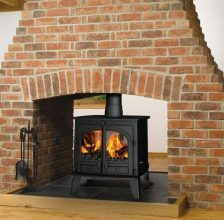 To ensure that Leeds Stove Centre has a variety of double sided stoves we have carefully selected only the very best manufacturers. Some of which includes Stovax Stoves and Yeoman Stoves. The majority of our double sided stoves are either multi fuel stoves or wood burning stoves. If you are purchasing a wood burning stove it is important to check whether you are in a smoke control area. You can find out whether you are here. If you are in a smoke control area, you need not worry, Leeds Stove Centre has a fantastic range of DEFRA approved stoves which you can use in these areas. Installation of your stove should not be done by yourself, you should always use a professional stove installer. Leeds Stove Centre does offer a stove installation service should you want us to install your new double sided stove for you. All of our highly experienced stove installers are HETAS approved and Gas Safe Registered.